This study is about Rohingya refugees and camp life, in Cox’s Bazar in Bangladesh. In terms of theory the starting point is the impact of one-sided violence on livelihoods of displaced people. It considers their past flight from Burma and their present struggles to survive amidst the resource shortages inside the refugee camps where they find themselves forcibly contained. 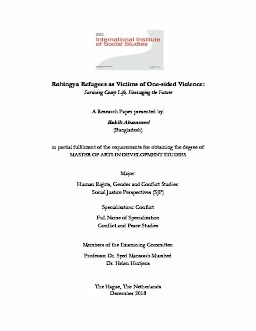 The study aims to explore the strat-egies that Rohingya refugees use to survive in the restricting conditions of the camp, how they perceive violence and how violent displacement has affected their livelihoods. In addition, the study asked how Rohingya refugees envisage their future, and the prospects for return. In order to answer some of these questions, the author conducted a survey of 85 heads of households (80 male 5 female), selected randomly from two different sectors in two camps. Qualitative interviews were also conducted with 22 informants, 13 refugees, five locals and four NGO workers (in total 18 male 4 female). A pilot was conducted to refine the survey questions, and the final results collated through use of MS Excel to produce tables, graphs, diagrams and other visual representations of results. There were three key findings. First, the survey results and interviews confirm that the Rohingya are genuine refugees, in the sense that they fled and were unable to take their assets and documents with them. Second, in the present the study shows that they struggle to find means of living, work, money and basic services in the camp. Although they are fed, it is at subsistence level. Thirdly, return is unlikely for geo-strategic reasons, and is also not considered a serious possibility by the refugees themselves. Because of this, combined with the extent and duration of one-sided violence in Burma, the Rohingya now find them-selves unable to foresee their own future, whether in Bangladesh or elsewhere, and to plan accordingly. The study concludes that international attention is required to resolve the future of the Rohingya in a sustainable manner.